Now that the 2011-2012 session of the Minnesota Legislature has concluded, it’s time to take a look back at Governor Dayton’s top veto letters. With so many bad ideas being turned into bills by the careening Republican leadership, he was busy. Of the 299 regular session bills passed by the Legislature, Dayton officially vetoed 54 and “vetoed” both constitutional amendments. There are some real gems in these veto letters. Here are some of my favorites. Dayton’s veto of SF 509 in 2011 precipitated the Republican push for the Voter ID amendment that will appear on the ballot in November. It’s easy to forget, but SF509 was far worse, and would have radically reshaped Minnesota’s election system. Dayton’s letter is a full-throated defense of Minnesota’s best-in-the-nation election system. Minnesota’s election system is the best in the nation. We have the highest voter turnout year after year and under intense, bipartisan scrutiny, the recent statewide recounts have highlighted how reliable the results are. Much of the strength of the system derives from over 150 years of bipartisan work and its federated nature – the 87 county auditors, hundreds of municipal clerks, and 30,000 volunteer election judges who administer Minnesota’s elections and ensure they are free and fair. The right to vote is embedded in both the United States and Minnesota Constitutions. In accordance with my oath to uphold both of these foundational documents, it is my duty as Governor to ensure every eligible Minnesota voter is able to exercise this fundamental right and does not face barriers to doing so. The 2012 session saw a series of anti-choice bills pass the Minnesota Legislature. Abortion rights are one of the most important areas where Dayton has blocked the far right agenda of the Republican legislature. What I appreciate about his letter vetoing HF 936 is his clear and unwavering position in favor of reproductive rights. House File 936 infringes upon a woman’ s basic right to health and safety. The bill forces doctors to make critical medical decisions, but prevents them from considering the best interests of their patients. This is not consistent with standards of good medical practice. Medical research, findings, and conclusions are best left to experts who are trained to make medical, not political, decisions, and who are in the best position to protect a woman’s health. Upon taking office, Governor Dayton was given a windfall from the end of the previous legislative session, the ability to expand Medical Assistance. The signing of this executive order was a huge achievement, and his veto of HF 760 made clear that he would defend that expansion at all costs. Somehow, Dr. Edward Ehlinger survived. I find it unconscionable that this bill eliminates health care coverage for over 140,000 people. If all of those losing coverage comprised a new community, it would be the third-largest city in Minnesota, far ahead of the populations of Rochester and Duluth. This is accomplished in part by the repeal of the expansion of Medical Assistance to adults without children implemented under my Executive Order. I have made it very clear, but I will repeat it yet again: I will veto any legislation that repeals the expansion of Medical Assistance. This expansion has provided access to quality, comprehensive health care for 100,000 of Minnesota’s poorest and most vulnerable citizens. The Republican war on public employees was displayed most clearly in SF 1047, which included a provision pushed by Rep. Keith Downey to reduce the number of state employees by 15% across the board, regardless of need or cost. 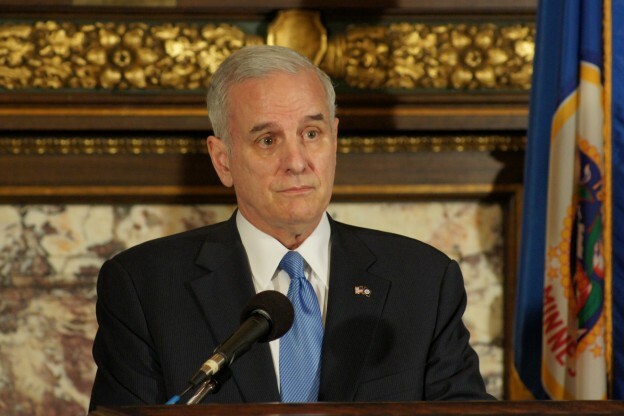 Dayton’s veto letter calls it what it is – uninformed gimmickry. This bill would reduce the state workforce by 15% regardless of funding source or need, which would result in an arbitrary decrease in employees who provide critical government services. What successful business executives would order an across-the-board 15% employee reduction in all operations, regardless of their size, efficiency, profitability, and need? This drastic cut would greatly damage our ability to deliver services like plowing roads and maintaining parks. I cannot agree to a blanket 15% workforce reduction, especially when it occurs on top of other agency specific budget cuts. Dayton’s veto of HF 42, the 2011 regular session tax bill, demands shared sacrifice on the part of the wealthiest Minnesotans. Regrettably, this was one thing he could not get the Legislature to agree on. They preferred borrowing from schools and future revenue to asking for even a penny from the rich. Your budget solution, which results in the bottom 90% of households paying nearly 20% more of each dollar of income in state and local taxes than do the top 10%, is unacceptable to me. Under your proposal, Minnesota’s state and local tax system would become more regressive. My proposal, on the other hand, asks the state’s wealthiest 2% to contribute to solving our budget challenge and, even after this increase, the wealthiest 2% would still pay a smaller share of their incomes in state and local taxes than other Minnesotans. One of the most important vetoes of Mark Dayton’s first Legislative session was his first. That first veto sent a clear signal that he would demand a global agreement on revenue and program budgets instead of conceding to piecemeal cutting. It also started a trend – invoking the vetoes of former Governor Tim Pawlenty to justify his actions. Third, I disagree with this legislation’s piecemeal approach to resolving the projected deficit for the next biennium. There is nothing to be gained, and much to be lost, by addressing, in this disjointed manner, the projected budget deficit for the biennium that does not begin until July 1. Budget decisions are a reflection of priorities. Your immediate cuts of funds for higher education, human services, and aid to local governments, while increasing property taxes on businesses and middle-income taxpayers, show misguided priorities, which should be reviewed in the context of other alternatives. That careful and reasoned consideration of all options, and the opportunity for those Minnesotans who will be affected by your decisions to be heard in public meetings of your committees, is the sound intent of the Minnesota Constitution in establishing a five-month legislative session. Your rush to judgment on these matters disregards that proven wisdom. Almost a year ago today, on February 18, 2010, Governor Pawlenty rejected legislation with these words: “As the state struggles to resolve a $1.2 billion deficit [for the current biennium], the passage of this legislation is at best premature. Legislation that appropriates significant funds simply cannot be passed in a piecemeal fashion. A comprehensive, balanced budget solution must first be reached.” In that respect, Governor Pawlenty was correct. Tune in tomorrow for the top five veto letters! You can comment on this post or suggest your picks for the top five at our Facebook page.